This started off as someone wanting to sell his service but it turned out into a nice discussion on why not to buy fake likes so I will leave it here in the hopes of helping other people. ###Buying fake followers, likes, or views will DESTROY your accounts engagement rate!!! They are NON-ACTIVE followers, and therefor will never engage with your posted content. The more followers you buy, the lower and lower your engagement rate will become. 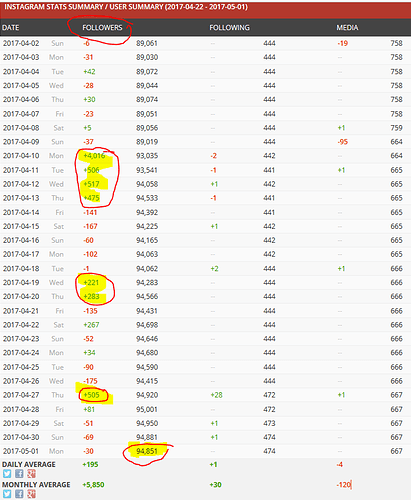 Please Click Here to see an example of an account that bought only 5k followers, and now has extremely BAD daily follower growth. ALSO read the comments made after the post to learn more about the damage. ###Here is some more great topics about engagement rate, buying fake followers, and the damage from non-active followers. If you buy 4.000 followers this 4.000 followers give you 0 likes & 0 comments. Don't buy anything. Sorry @elitepanel but there is enough people dealing with bad engagement here on the forum. If people buy your service, and do not know the dangers, this will dramatically increase the amount of problems people will have with their accounts, and increase the amount of posts I have to make to fix the damage done. Your service is the root cause of a large percentage, and therefor I will do my best to stop it here. PS. I am not sure if you are allowed to promote your service here. @Johnny @Adnan correct me if I am wrong. Anyone good service for buying IG Followers? Hey, sorry to hear that’s how you feel. Most people purchasing SMM services are not bothered by engagement rate. It’s actually a quite common service and it does people more help than harm. 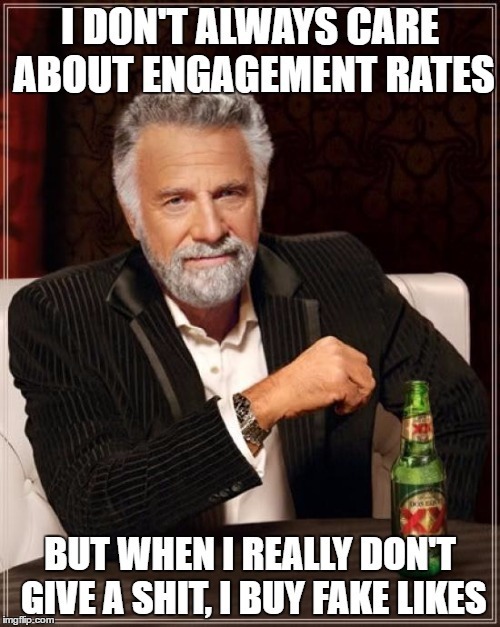 You are not convincing me, and you clearly do not know the importance of engagement rates. I owned one of the largest SMM Panels, and operated multiple high ranking retail websites selling fake followers, likes, views, and comments for Facebook, Instagram, Twitter, YouTube, Sound Cloud, and many other platforms. I used to do exactly what you do on a much larger scale. At first I though it was a great idea in the sense that you can make an account “look” very popular and therefor gain the trust of potential customers. But I soon noticed that once an account received more and more fake followers, the account began to grow much slower, and get limited exposure when posting pictures. The accounts were practically invisible, and you could no longer use traditional (organic) methods of promoting the account. My account became dependent on buying fake followers to grow, just like a drug addict becomes dependent on their drug of choice. You would have to be blind not to see this on your customers accounts. I Think Engagement Rates are useless. I second that, ive purchased on three occasions a follower buying service. First instance was for facebook, I had a female bikini company that clients wanted likes / friends. After the purchase, the account was then liked and added with an audience of 500 members of male non-english speaking persons. Even after explaining in depth with the seller the type of target audience that was required. The result, took me half an hour to delete all likes and FB followers. 2nd occasion, i bought 4000 instagram followers (for the bikini client’s IG account), advertised as British and USA followers i was presented with 4000 bot followers where the majority was non english speaking and were neither UK or USA and were mostly made up 90% from male and young children, no picture profiles and company IG accounts wtf? 3rd occasion (haven’t learnt lesson yet ) after reading review after review and grilling the seller about the authenticity of real followers and how they are sourced I decided it sounded legit enough to roll the dice. I purchased 1k followers and 500 followers on two separate IG accounts. Having my previous experience, after the first few hundred followers i knew immediately they were bots. I tried to stop the flow by even temp disabling both accounts and asking the seller to stop the follower feed. When i re-opened the accounts the followers were pending and still uploaded. The aftermath, the 4k account i just left idle for two months, the follower count never went down, a sign of non-engaged bot followers, i received no likes and not comments from any of the audience. In the end it took me a week to block the followers down to like 10 followers. On a positive note, by using hashtag strategy and deleting under-performing posts, i have seemed to recovered this account now as its back up to 1k in followers organic growth with anywhere from 200-400 likes a pic. Unfortunately, the other account (my business account) that only I had 500 bought followers has never recovered. I blocked all the fake followers and even though it wasn’t many bought followers, it still stuffed engagement on the account going down from 250-300 likes to 80 likes. The account has double the the followers now when i was getting 250 likes and still barely gets to 100 likes, but slowly recovering after a month. The other account that got 3k in followers, was so devastated that it got shadowed/lower exposed and what use is a account with bot followers and low exposure. Lesson learnt by me, ill never buy followers ever again. But the thing i love about this forum as opposed to others ahem (BHW, epicnpc) what the elder statespersons such as @BrandonBerner promote are that proper techniques to real growth and that slow yet steady always wins the race. Forget about size perceptions at the beginning. I suggest to the OP to try the other forums or fiverr where the audience is a bit less experience and less informed. EDIT: p.s the lower the price the more chance it will bot followers, but from my experience it doesnt matter how much you pay, there will be a % of followers that will be fake/bot and will mess up any potential growth. You were right, the marketplace has rules and op didn’t follow them so he was not allowed to post this here. I see it’s solved now though. My crazy feature request actually covers this. In order to create the highest quality “like” bot farm, you would need MP to only like the content of X user IF the post hit a top 9 for X hashtag. Plus the likes would need to appear more organic, such as a dripfeed, as well as the account would only search/like X times for it. This part gets a little hectic. You would then need the other X accounts to search for/like that content so that it’s not the same account blindly liking the content of X account. Fake followers are bad, continued use of engagement groups and purchased likes I would say are on par with one another. Actually, there is probably not much difference to IG at all if you have purchased likes or in an engagement group. The organic method would (theory) carry the most “weight”. You buy @BrandonBerner’s hashtag research. Your post hits top 9 stage 1. Now accounts can find it and like it or follow. Organic right? If MP accounts did the same, only liking content of accounts that are top 9 or still in “recent” then that would be organic as opposed to searching all hashtags and liking all of them. Just my two cents on this thread. Sorry dev team, I know this is a poop ton of work for you to try to implement, I am just trying to forecast ways around the algorithm. EDIT: I believe this would also help in preventing the limited exposure etc phenomenon we see. The more organic the better right? 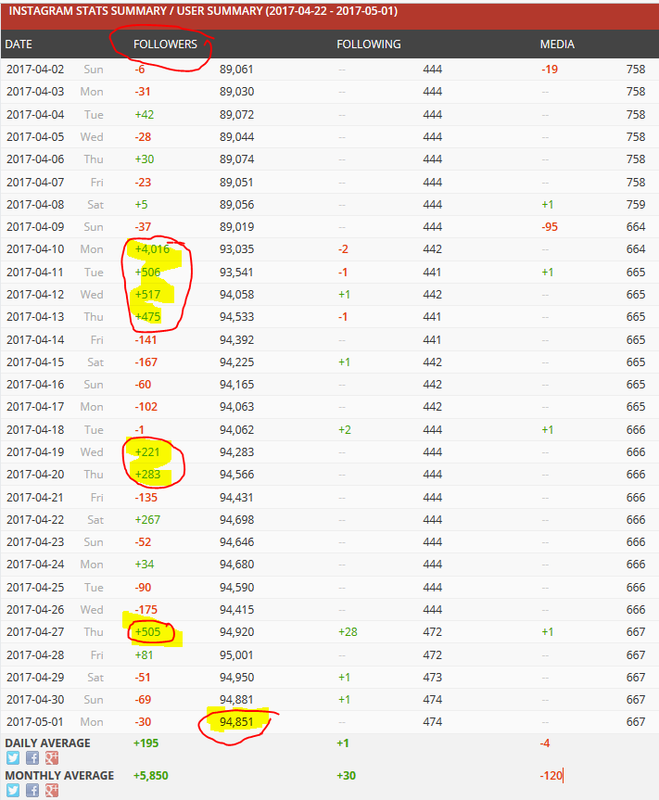 Still, there is no growth - and he has a really huge account (89K+ before he bought followers). This user has gained 5,000 followers in the last 4 weeks - and very likely all of them were bought… He did it maybe because the engagement rate (ER) was low - and according to BrandonBerner’s excellent explanation - he has worsened it now as he might face an even worse “limited exposure”. I never think fake likes are a good idea. Frankly, if you want to go down that route, take the time to create your own sock accounts & have them like everything you post. At least you would consistently get likes without paying every time. I generally agree with what others have said about fake followers, too. However, I don’t see a problem buying 1000 or so for a brand new account. My follow back rates are much higher when I do that - because I obviously don’t look like a loser with 12 followers! I’d never go above that, though. Don’t go overboard on the likes. If you have bad engagement, it can stimulate a social signal that the content is good. Just don’t go from 400 likes to 6k likes per photo, it will be easy to notice when you started and when you stopped. I believe it is no more different than an Engagement group. I think IG punishes both people who buy likes and who are in these massive engagement groups. Buying fake followers? Why? Follow and unfollow until you hit 1k real followers. Your posts will have real interaction/comments etc, it takes no time to get to 1k that way. Plus you follow the people who are willing to follow hundreds more accounts. When you unfollow them, they don’t even notice. No chance of them getting banned, low chance they will get angry, and your social blade stats look better. Forget the 1%…it’s the 6% you gotta worry about. Buying followers right away on a new account I find is worse than buying fake followers on an established account. Here is a post I write a while back. How to increase your Instagram Follower Activity?! I have learned this from my past mistakes. Instagram did not always consider engagement as the most important aspect to whether or not an account is granted more exposure. That being said, I would always buy 10k followers on new accounts I created so they get ranked faster and appear more popular. I continued to do this after the update (that limits exposure based on engagement) and the accounts that I did this to are growing so damn slow (still to this day). Back then I decided to create more accounts and I DID NOT buy any fake followers on them. To my supersize, these accounts had the same engagement rate within just a week, and the accounts grew 10x faster (or more). No, no… I was talking about buying followers on a new account. Not likes. Sorry, that was a typo. I meant followers. Is Buying Website traffic from smm panels for website good? What are the consequences of getting Website traffic via smm panels? If source & medium on Google analytics show as Facebook then can this be genuine? Can google identify these smm traffic if the sourse/medium shows as facebook? Appreciate any advice on this. Thank you. Big Likes, Followers and Comments numbers on social media look impressive of your products and service. To achieve that goal, many people turn to fake like or followers, which are imprecisely referred to as bots. They likewise will give you little long-term benefit, and may well harm your account’s standing. Can we also talk here about Engagement Groups and Like Exchanges between networks? Do they also affect your overall page? @johnmart - Fake is bad, agree. How do you spot them, if they’re mixed with organic engagement. Also fake likes differ in quality: There are people on the dark side of the internet that have botnets with real, hacked accounts that offer a a like service. There’s nothing wrong in buying likes (especially if you run a business) under condition that 1) they come from real people 2) they are related to the niche-topic you’re posting about. Fake profiles are easy to spot (first thing you should look for is a dis-balance between the number of followers and number of likes per post (which should approximately be around 10% of the following count). And, there ARE services that sell real likes.